Lapham’s Quarterly: Mild, Medium or Hot? Published on May 3, 2017 in Uncategorized. 0 Comments Tags: barbecue, curry, lapham's quarterly. I’ve got a new piece up on the Lapham’s Quarterly blog, all about how Americans went from adventurous eaters to plain janes—and then back again. Much of what we view as American identity is English: pilgrims and Plymouth, pumpkin pie and pot roast. It’s seasoned with at most a few herbs, perhaps a few imported spices. It’s from this English heritage that much of our stereotype of being lovers of bland food comes from. But by the early nineteenth century, American cookbooks had begun to move away from pure British cuisine, reflecting America’s multiculturalism with increasingly fiery food. One of America’s earliest cookbooks is also considered one of the most influential: The Virginia Housewife by Mary Randolph, published in 1824. As food historian Karen Hess points out in her introduction to the 1984 reprint, Randolph’s recipe selection illustrated “an elemental change in palate” from somewhat tame English dishes to highly spiced regional cuisine. Randolph’s book contains half a dozen curry recipes and a homemade curry powder that uses a full ounce of cayenne pepper, as well as turmeric, coriander, cumin, ginger, nutmeg, and mace. The recipes reflected not only her British forebears’ love of curry (which also bucks the bland-food stereotype) but also a common trait of American port cities: a love of spicy cuisine from the Far East. Indigenous American foods are reflected in the recipe “To Barbecue Shote”: the origin of barbecue is the native word and cooking technique barbacoa, and in this recipe a “fat, young hog” is dressed in a sauce that includes garlic, black pepper, and highly seasoned mushroom ketchup (a soy-sauce-like concoction made from salted fermented mushrooms and spices). Enslaved black cooks brought dishes and spicy seasonings from the Caribbean like pepper pot, a tripe soup that includes whole dried chilies in Randolph’s recipe. Based on The Virginia Housewife, it would be safe to say that America in the first half of the nineteenth century was a very spicy place. A Peek into my Next Book–and a Chance to Help Fund it! Published on April 11, 2017 in Uncategorized. 1 Comment Tags: 19th century, 20th century, beer, brewing. I’ll be telling the story of a handwritten recipe journal created by a husband and wife from 1880-1910. The journal starts with recipes for the perfect lemon pie, homemade yeast, and chocolate cake. Then, there are chapters on medicine (like cholera cures and PMS aids), beer and wine (root beer, rhubarb wine, blackberry brandy), and finally mushroom foraging. The recipes in the book abruptly stop being recorded in 1910, because the man writing it was brutally murdered by his son-in-law in a crime so scandalous, it made national news headlines. As the author, I’ll take you along with me as I experiment with these recipes and use them to reveal how a loving, food-focused Midwestern family unraveled–and ended up the focus of a tragic crime. I’ve already begun recipe testing the dozen of baking recipes recorded in the book, dating to the 1880s. Here’s a little video of my mom and I working together. We tested 18 recipes together over four days, and went through more than three dozen eggs, nearly 2 gallons of milk, and three jars of molasses! So far we’ve made yeasted rolls and cakes: Sally Lunn rolls, eggy-sweet coffee puffets, hearty-health food Graham bread, a few fruit cakes. We also test three puddings (custards and a bread pudding) and three lemon meringue pies, as well as biscuits and quick breads. Every day, there was a “winner”–a recipe that clearly stood out as interesting, delicious, and easy enough for anyone to make. This coffee puffet is very light and slightly sweet. Meringue is folded in at the end to give the fluffy texture. These are Sally Lunn rolls, rising, a white flour dinner rolls. Mom and I were both pretty pleased at how well these turned out. The many layers of “Delmonico Pudding,” coconut custard on the bottom, meringue on top. Two lemon meringue pies! They both had their problems, tbh. Baking through these recipes was a fun challenge, but more importantly, they told me a little something about the woman who wrote them down, and the family who consumed them. But more on that..soon! If you’re interested in the project, stay tuned here for more updates, and get involved by donating here. Donations will be open until April 19, 2017. Published on April 4, 2017 in Eight Flavors. 8 Comments Tags: 20th century, chicken, garlic, james beard. Chicken. With 40 cloves of garlic. While writing my first book, Eight Flavors: The Untold Story of American Cuisine, I researched the eight most popular flavors in American cooking: black pepper, vanilla, chili powder, curry powder, soy sauce, garlic, MSG, and Sriracha. When I dived deep into each of these eight topics, I often found fascinating new information and recipes–some of which didn’t make it into the book. So over the next few months, I’ll be publishing this exclusive content on my blog! If it whets your appetite to read the whole book, make sure to get your own copy here. I’m trying to get a handle on James Beard. In my generation, he wasn’t a household name; but once your reach a certain level of foodie-ness, you’re indoctrinated. You’re taught he’s a deity of American food. Beard starred in the first food television show in 1946, a 15 minute program on NBC called “I Love to Eat.” Sadly, no copies of the episodes exist. Both Beard and Child created an interest in food that met in the middle between the housewiferly-domestic guides and the men-only haute restaurants of an earlier generation. In their DIY wake, cooks without formal culinary training began to open restaurants and head kitchens. I was looking into Beard’s history during my writing process for Eight Flavors because he is often credited with convincing Americans to like garlic. Beard often looked to French cuisine for inspiration, and loved the simple, flavorful cuisine of Provence, which he first encountered while being stationed there during WWII. 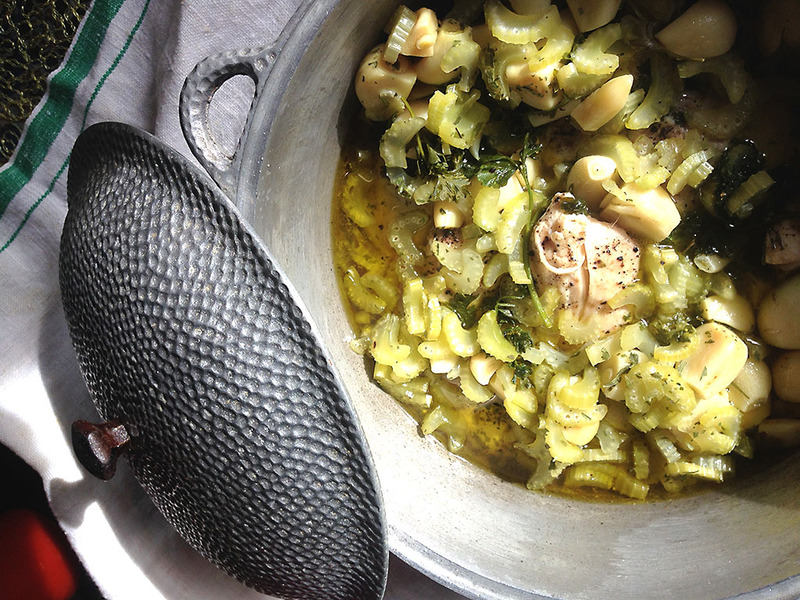 Provencal cuisine is also very garlic heavy. In America, leading up to WWII, people weren’t eating much garlic. It was associated with Italian immigrants, who were thought so unappealing, the US effectively banned Italian immigration in 1924. It was Beard who, with a rustic recipe, really began to change American’s minds about garlic. “Chicken with Forty Cloves of Garlic” was first published in 1974. The recipe title sounds ridiculous and intimidating, but 40 cloves is only 2-3 heads of garlic. Beard calmly instructed his readers to fill a casserole with chicken legs and thighs, cover them with olive oil and vermouth, and top them with tarragon, parsley, celery and garlic–so much garlic, it serves the purpose of the vegetable in the dish. 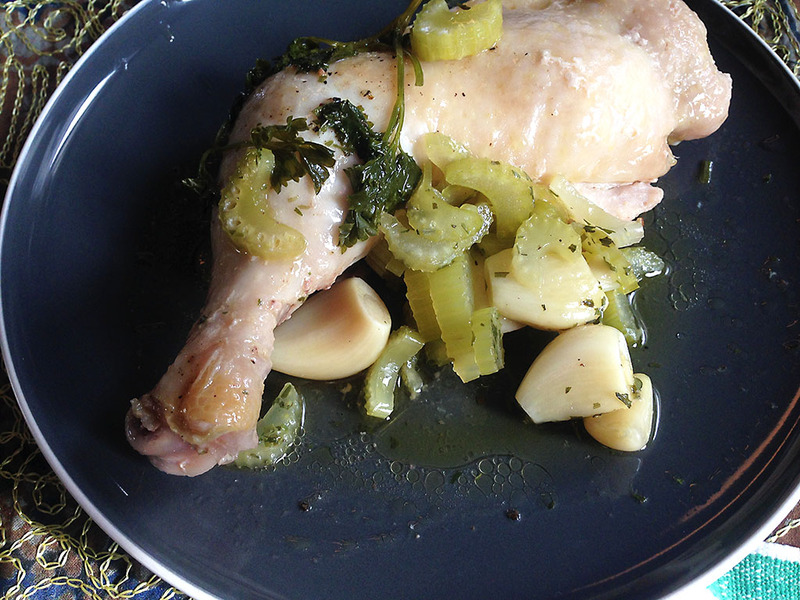 After baking for 90 minutes, the chicken comes out tender and mild–as does the garlic. Beard comforted the fears of worried cooks, stressed about the pungent taste of garlic: “Invite your guests to spread the softened garlic on the bread. They will find that the strong flavor has disappeared, leaving a wonderful, buttery paste perfumed with garlic.” It was the perfect recipe to convert the American masses because of the tame garlic flavor. Beard championed a new form of American cooking; inspired by French cuisine, but not slavishly imitating it. He emphasized fresh, seasonal ingredients featured in ambitious, sophisticated dishes. “Buy the best produce you can buy and do the least to it, and you’ll have the best food,” Beard once said. And we have him to thank (in part) for garlic becoming a part of mainstream American cuisine. Rinse chicken legs in cold water and pat dry with paper towels. Dip the chicken in olive oil to coat each piece and sprinkle with salt, pepper, and nutmeg. Put chicken in a lidded 3-quart casserole along with the residue of oil. Add the garlic, sliced celery, parsley, tarragon, and vermouth. Seal the top of the casserole with a sheet of foil and cover tightly. Bake for 1 1/2 hours in a preheated 375ºF oven. Do not remove the lid during the baking period. Serve with hot toast or thin slices of pumpernickel and spread the softened garlic on the bread. My Audio Book of Eight Flavors is out now! Guess what? You can now LISTEN to Eight Flavors: The Untold Story of American Cuisine on audio CD or Audible–including whispersync, which allows you to switch back and forth between e-book and audio book without losing your place! AND GUESS WHAT ELSE. I read the book! It’s 11-ish hours of my sweet, sylvan voice telling you tales about Edmond Albius, a 12-year-old slave who discovered the technique still used to pollinate vanilla orchids today; or Ranji Smile, a Muslim immigrant to American who became a celebrity chef; or so many more American stories! Buy the audio book here! Enjoy it! Then sign up for my mailing list and see if I’m going to do an event near you! Published on March 6, 2017 in other writings. 1 Comment Tags: 20th century, fish, japan, sushi. I’ve got a new article up on mental_floss, and it digs up the history of sushi! Today, meeting friends for sushi is almost as American as going out for a beer and a pizza. It’s proof positive that when we leave our hearts—and plates—open to other cultures, good things often come of it. Find out how we became sushi lovers: I talk about America’s first sushi restaurants, the TV miniseries that made Americans obsessed with Japan, and how some “American-style” sushi rolls are making their way back across the ocean! Read more here. Eight Flavors: My Book is on Sale NOW! My first book, Eight Flavors:The Untold Story of American Cuisine, DROPS TODAY! You can get it direct from the publisher, on Amazon, Barnes and Noble, indie bookstores–or anywhere else books are sold! For a full list of retailers, click here. –Brooklyn BasedSmithsonian Magazine named it one of the best food books of 2016! It’s the perfect gift for the foodie in your life!! If you live in New York City, I’ll be signing copies tomorrow night (Wednesday) at The Lower East Side Tenement Museum after my free Tenement Talk with Melissa Clark, from 6-8:30pm. Afterwards, I’ll be at the launch party at Lucky Jack’s until 10pm. Feel free to stop by! Tuesday, December 13th I’ll be at The Brooklyn Historical Society leading a panel with Mario Carbone and Jonathan Wu on How Immigrant Cooks Shape American Food. Doors: 6:30 pm Event: 7 pm and I’ll be signing books afterwards. In the early spring, I’ll be in Boston and Baltimore! More details coming soon. Published on December 5, 2016 in Eight Flavors. 10 Comments Tags: chicken, curry, immigrants, india, tenement museum. 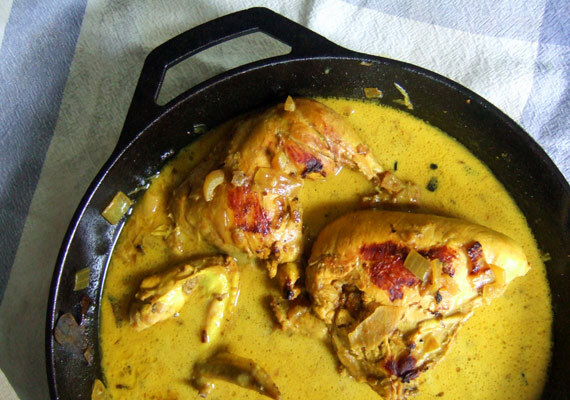 A chicken curry from the 1850s. To create my first book, Eight Flavors: The Untold Story of American Cuisine, I researched the eight most popular flavors in American cooking: black pepper, vanilla, chili powder, curry powder, soy sauce, garlic, MSG, and Sriracha. When I dived deep into each of these eight topics, I often found fascinating new information and recipes–some of which didn’t make it into the book. So over the next few months, I’ll be publishing this exclusive content on my blog! If it whets your appetite to read the whole book, make sure to get your own copy here. One week after the 2016 presidential election, I attended a citizenship ceremony hosted by the Lower East Side Tenement Museum. Fifteen individuals, their birthplaces as wide ranging as Japan and Iraq, became Americans that day. You are what America looks like…We are a nation of immigrants, but for as long as this nation has existed, Americans have been harkening back to a golden era, before families like yours or mine got here. It never seems to matter to those people that their parents or grandparents were on the receiving end of similar discrimination when they first arrived in this country. But even if we know deep down that such intolerance is as old as the nation itself, it doesn’t make it hurt any less when we experience it. You may hear some people say that in order to become “real” Americans, you need to forget where you came from, or leave behind the history that brought you to this moment. Cover up your accent, change the way you dress…Please don’t list to those voices. Joining a new nation does not mean you have to leave behind the one you came from, or what it taught you. You can watch Power’s speech in its entirety here. I had attended this citizenship ceremony in the past, in 2013, to see my dear friend and colleague Raj become an American. Raj is an immigrant from New Zealand; his parents are from India. I talk about Raj in the Curry Powder chapter of my book; we went on a “curry crawl” together in Jackson Heights, Queens. In that chapter, I also focus on the stories of Indian immigrants in the early 20th century who were not allowed to receive their citizenship because of the color of their skin. 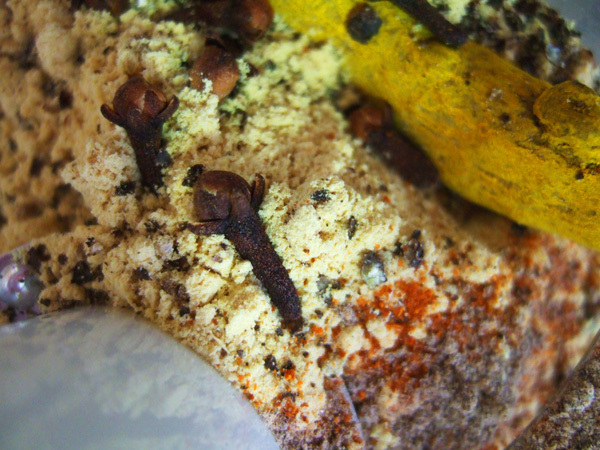 Often, when I list the flavors I’ve included in my book, I get a lot of push-back about curry powder. Many people don’t consider it an American ingredient. But Indian immigrants have been coming to America for more than 100 years; and we have been cooking with curry powder in this country for over 200 hundred. In fact, a dish called Country Captain Chicken, a traditional dish of the American South, arrived in this country in the 19th century through our Anglo-immigrant roots. The origin of Country Captain Chickens begins late in the 16th century, when the East India Company was granted a royal charter by Queen Elizabeth. The charter gave the East India Company a monopoly within Britain on trade with the Far East; the company would focus on India. As the East Indian Company rapidly expanded in the 19th century, more and more employees moved to the “Country,” as India was known. They were posted to a new station in another part of India every three years, which exposed them to culinary traditions all over the subcontinent. When these British workers traveled around the subcontinent, they were carried in a litter by a team of men, the carriers traded out at roadside taverns like horses. The litter itself was misery, being shaped like a wooden coffin in which the traveler slowly baked in the Indian sun. When they stopped for food at a roadside eatery, called a “bungalow,” they were often served chicken. Beef and pork were not served in much of India because of Hindu and Muslim religious restrictions. And beyond that, chicken, no matter what the continent, was the convenience food of the 19th century. If you had sudden dinner guests, you could step out your back door and scoop up one of the chickens pecking around in the yard. A few hours of plucking and butchering later, you had a chicken dinner. It doesn’t sound convenient–but most other meat was seasonal. A chicken was available anytime. Because British officials didn’t have the same cultural history and connection to each region as a native Indian, when eating at home, they would take the foods they loved willy-nilly from all regions and serve them together. A bowl of Anglo curry could be accompanied by garnishes from everywhere: Persian hard-boiled eggs, Punjabi pickled lemon, Madras-style sliced raw onions, fried papadum bread, as well as British-style crispy bacon. The transient English officials created a trans-continental cuisine, which became the food they imported when they returned to England. And that cuisine eventually traveled to America. Country Captain Chicken, a dish inspired by the bungalow dinners of the British, first showed up in America in Eliza Leslie’s 1857 cookbook Miss Leslie’s New Cookery Book. Although Leslie was born in Philadelphia, she lived in England from the ages of 5-11. It’s likely that as a girl she was exposed to the Anglo curries being served in British households, and transported her love of spicy, fried Country Captain Chicken back to the States. 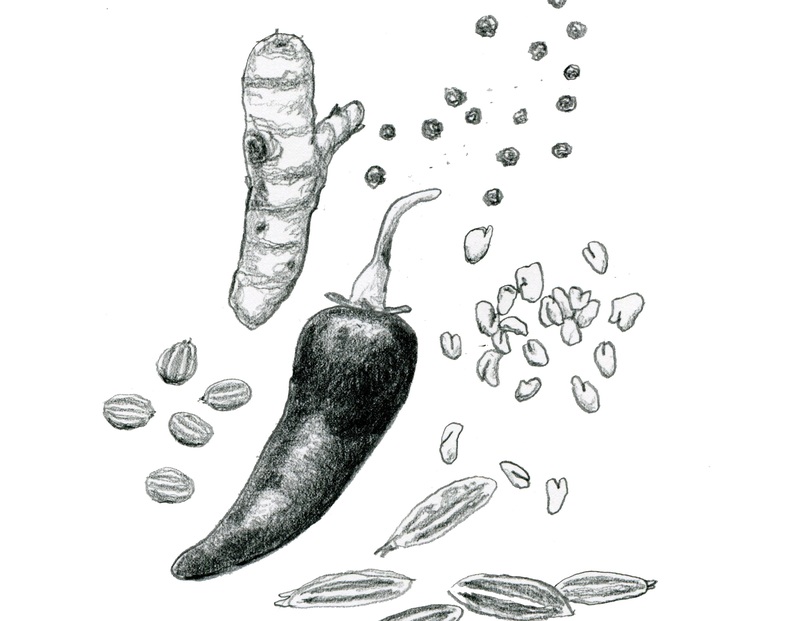 Curry powder ingredients according to a 19th century American recipe. Leslie’s recipe asks the home cook to rub chicken parts in curry powder before frying them up crisp in butter and onions. The chicken is lifted out of the butter with a slotted spoon, and set aside to drain. A sauce is made from the butter and onions, with the addition of a few spoonfuls of coconut. 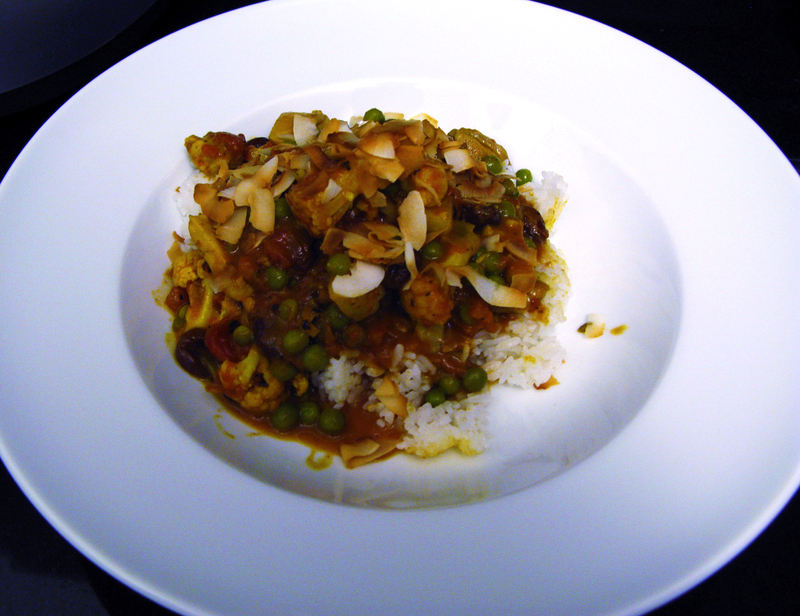 It’s all served over rice, and the crispy chicken skin makes a lovely textural contrast to the sauce. Recipe adapted by Jill Paradiso from Miss Leslie’s New Cookery Book, 1857.
spices for the best flavor. thighs, drumsticks, and wings, and continue cooking another 6 minutes. curry powder until well coated. from pan. Season chicken with salt and set aside. onions are lightly browned, stirring occasionally. over any kind of rice you like. Modern Country Captain Chicken. Photo by Dan Costin. By the 1940s, Country Captain Chicken had spread from Philadelphia and appeared in the American South in church-fundraising cookbooks alongside Jello mold with marshmallows. It maintains a crazy level of popularity to this day, with several Southern cities laying claim to its invention. In the contemporary version, the chicken, after being fried, is stewed in the oven in a tomato sauce. And the few spoonfuls of coconut in Leslie’s recipe are replaced by a whole assortment of toppings served table side: slivered almonds, raisins, chutney, orange sections, pineapple and crispy bacon — much liked the varied condiments on the tables of the East India Company in the 18th and early 19th centuries. In the South, these condiments are called “boys,” but according to one Savannah hostess, “Anything more than a five boy curry is considered pretentious north of Gaston Street.” Check out a modern recipe here. Much of the background on The East India Company came from the fascinating book Curry: A Tale of Cooks and Conquerors by Lizzie Collingham. The Perils of Assimilation: How what we eat makes us American, for better or worse. Published on December 4, 2016 in Uncategorized. 0 Comments Tags: health, immigration, tenement museum. I’ve got a new post up on Notes from the Tenement, The Lower East Side Tenement Museum’s blog, that gives more context to the Eating Like an Italian Immigrant Family experiment I did a few weeks ago. The piece takes a close look at the attitudes of American social workers and nutritionists at the turn-of-the-century regarding the diets of new Italian immigrants, and finds some striking parallels in the present day. To greet this enormous wave of immigration, there were a growing number of American-born social workers occupying settlement houses, early social aid organizations that tackled the “settling” of new immigrants. The social workers offered a helping hand in Americanization. “The settlement ideal has included the preservation of the dignity and self-esteem of the immigrant,” Breckenridge wrote in her 1921 book, New Homes for Old, “while attempting to modify his habits when necessary… .” For Italian immigrants, it was their cooking habits that needed to be modified. Read my entire article here. Published on December 1, 2016 in Eight Flavors. 2 Comments Tags: curry powder, msg, soy sauce, vanilla. All the eight flavors. Click for a larger image. My first book, Eight Flavors: The Untold Story of American Cuisine will be released December 6th, but is available for pre-sale right now. To create the book, I researched the eight most popular flavors in American cooking: black pepper, vanilla, chili powder, curry powder, soy sauce, garlic, MSG, and Sriracha. When I dived deep into each of these eight topics, I often found fascinating new information and recipes–some of which didn’t make it into the book. So over the next few months, I’ll be publishing this exclusive content on my blog! If it whets your appetite to read the whole book, make sure to get your own copy here. The premise of my new book, Eight Flavors, is that American cuisine can be illustrated by its most commonly used flavors. One of the most freqeunt questions I get about the book is how I picked my eight flavors to focus on. When I began my research, I made a timeline of recipes from my respectable collection of cookbooks, dating from Amelia Simmons’s American Cookery, the first cookbook published in this country in 1796, all the way through modern American standards like How to Cook Everything by Mark Bittman. I flipped through these cookbooks from different eras: the 1800s, 1850s, 1900s, and 1950s, selecting the most influential tomes from those periods, like Mary Randolph’s The Virginia Housewife; Fannie Merritt Farmer’s The Boston Cooking-School Cookbook; and James Beard’s The Fireside Cook Book. I looked for ingredients that significantly affected the flavor of the recipe. After I made a list of commonly used flavors, I plotted them on a graph with the help of Google’s Ngram Viewer, which visualizes the frequency of words in all the books Google has digitized. I set the sample size to American books from 1800 to 2000. When I built the graph of American flavors, it revealed which ones were used the most frequently (and for all practical purposes, were the most popular), when flavors entered our lexicon, and how some grew in popularity while others disappeared. After all was said and done, the results revealed eight winners—flavors that were the most popular, and had never significantly waned in their popularity. The graph at the top of the page shows them all, and gives a really clear sense of how these flavors entered into our kitchens chronologically. I love in that top graph how clear garlic’s popularity is over the other flavors I talk about. I write in the book that vanilla replaced rosewater in American kitchens, and you can see that below. And look at how long curry powder has been used in the U.S.! And look at how our use of MSG has declined in the last 30 years. I unpack the perception that MSG is “bad” for you in my book, but you can also listen to some great podcasts on the topic here. These graphs gave me a quick and dirty way to identify trends over time, and a wonderful way to visualize how our larger culture was affecting consumption of these ingredients, and vice verse. Published on November 29, 2016 in podcast. 1 Comment Tags: black pepper, eight flavors, gastropod, sriracha. I’m on the fabulous Gastropod podcast! Talking about my new book, Eight Flavors: The Untold Story of American Cuisine! In this episode, Lohman introduces us to the historical and biological secrets behind two of those winning flavors: black pepper and sriracha. Black pepper is such a staple that it’s hard to imagine the American dinner table without it. But we have a grumpy Massachusetts colonial-era merchant and his much friendlier son, as well as the Food Network and a pain-inducing chemical called piperine, to thank for the spice’s ubiquity today. Sriracha is the latest addition to the American flavor palate, with everything from sriracha-flavored potato chips to sriracha baby food sweeping the market. But how on earth did a Vietnamese spicy sauce used to pep up roast dog become a staple on the shelves of Walmart? Join us this episode as we find out the history and science behind these flavors’ successes—and survive our first, and, we hope, only, black pepper tasting session. On the podcast, I talk about Martha Washington’s recipe “To Make Pepper Cakes That Will Keep Good in Ye House for a Quarter or Halfe a Year.” If you’d like to read about my experiences with that recipe, and see the finished cakes, go here. And below is a recipe for a delicious modernized version from my book, Black Pepper Brown Sugar Cookies. I choose to use Sarawak peppercorns from Indonesia, as the pepper has notes of citrus and coriander that lend itself well to desserts. In fact, we notes its sweetness when we taste tested it on Gastropod, and its packaging noted it paired well with sweet creams and fruits. But any black pepper you have will work for this recipe. 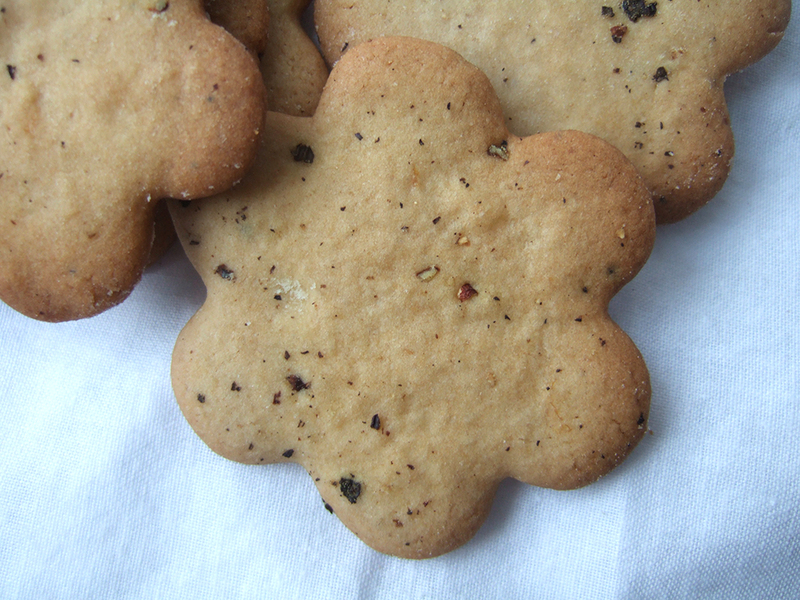 The result is a chewy cookie, speckled with pretty bits of black pepper. Recipe modernized from Martha Washington’s A Book of Cookery. In a large bowl, whisk together dry ingredients and spices. In the bowl of an electric mixer, add butter, sugar, and orange zest. Using the paddle attachment, beat on medium-high until light in color. wrap in plastic wrap, and chill at least 1 hour and as long as overnight. gently press the pepper in with the rolling-pin. Listen here, and if you love food, be sure to subscribe to Gastropod on Itunes! And buy my book here! !